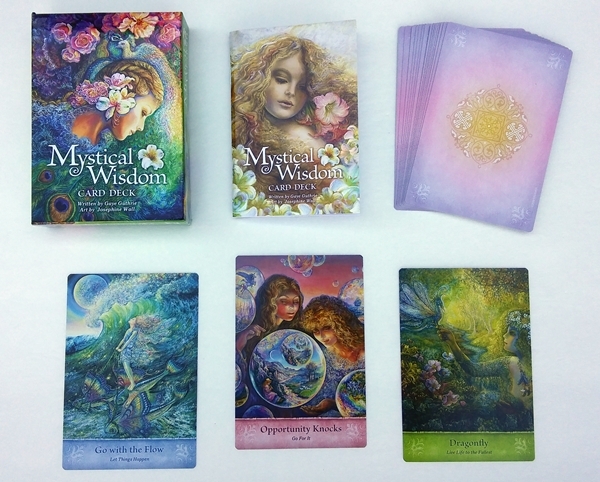 Mystical Wisdom is an uplifting card deck by Gaye Guthrie, intricately illustrated by Josephine Wall and published by US Games Systems, Inc. The cards offer guidance from angels, fairies, mythical creatures and animal spirits. The 46 cards measure 3.75" x 5.5". With cards of this size, I am unable to riffle shuffle them comfortably in the usual manner. But luckily, the cards are flexible enough to riffle shuffle vertically. This is so important to me, because I live for riffle shuffling. The cards are borderless on three sides (yay!) with bottom borders of various colors throughout the deck. The bottom border features the card name and key phrase. The backs are a soft antiquated pink/purple with a reversible design. There is a copyright marking on the lower right edge of the backs, so they are not entirely reversible. The cards are not glossy, but there is a slight sheen to them in the light. The cards and booklet are housed in a strong and sturdy cardboard box with cutouts for ease in lifting the top off. The illustrations are very intricate, colorful and busy. When first going through the deck, I thought it was going to be way too chaotic for me to read with. And I still can't see myself using this deck for big multi-card spreads for this reason. But for single card pulls or very small layouts, the amount of detail in each card is wonderful. Some of the cards are less busy than others, but most of them have a lot going on. So for a single question, there are so many places for your intuitive eye to fall on. There are many layers to the answers you will receive. The majority of the cards are concepts such as Resilience, Illusion, Intuition, Money, Letting Go, etc. There are also seven animal (both real and mythical) cards (Dragonfly, Owl, Dolphin, Dove, Peacock, Unicorn, Dragon) in addition to an Animal Bond card. There are two Archangel cards: Raphael and Gabriel. I do wonder why only two of the Archangels were included, and why these two were specifically selected. There is also an Angel of Miracles card. Two cards I really like in the deck are titled Seven Heavenly Virtues and Seven Deadly Sins. I'm a sucker for very specific opposites in decks, and these are such an interesting and unique inclusion. There is a "Children" card that I find limiting. The book has a 4-sentence description of this card, along with the key phrase "Know that your children are protected" and mantra "My children are happy and safe". The card lets you know that God and the angels are protecting your children. What about people with no children? There is no alternate, metaphorical meaning given for this card. When decks include a card like this, exclusive to a certain group of the population, I scratch my head a bit. All the main characters in the deck are women. The only men are found in the distant backgrounds of some of the cards, as side characters. The illustrations are packed with dream-like fantasy elements. You will find unicorns, mermaids, a winged centaur, a young man with antlers, a deer/bird hybrid, a dragon with dragonfly wings, fish with butterfly wings, fairies, and a leprechaun (? ), just for starters. You'll also see Victorian age London, romantic Renaissance scenes, fantasy nature elements, an Oscar (Academy Award) statue, castles and spiral staircases (love a spiral staircase!). There is just so much to see and explore in these cards. I love that you can definitely find the unexpected within this deck. From a distance, the cards look a bit similar to one another, but you will be delighted upon closer inspection on the surprising details you will find. The beautiful illustrations and colors transport you into another world. A surreal place where your intuition can work wonders if you let it roam free. My first reading with this deck amazed me. That morning, I had asked another oracle deck how I could change my relationship with money. I received cards that told me to stop believing I had to conform to society's rules about money. I needed to shift my mindset and allow myself to know that nonconformity and originality can be attractive to the energy of money. That night, I took the Mystical Wisdom deck out for the first time and simply asked what I needed to know. I drew the cards Money and Originality. They gave me the exact same message I received earlier that day from another deck! Down to the same exact words that had come to me! I was blown away. For my second draw, I pulled a single card and drew the gorgeous Illusion card. In the card, I saw the message that "something is not as it seems" and that unveiling this truth would be of great benefit. I saw that the illusion might be difficult to penetrate, as it had been something I viewed as a part of myself. The mirror image in the card is actually not a mirror image! The lady's face looks forward, while the mirror image is turned more to the side. In this, I saw that when we identify with an illusion, we often can't see it. One day I drew the Good Fortune card and I received a wonderful package in the mail, and also very exciting news via email. The card hit the nail on the head that day! The next day I drew the Choices card, and I absolutely was faced with a very difficult decision to make that day. This card helped me make the right decision, because it reminded me to make the right choice for ME. I was very grateful for drawing this perfect card for the day. I did as the card suggested. The day after that, I drew the Children card, which says my children are protected. And wouldn't you know it, the decision I made with the help of the previous card's message (it involved my kids) resulted in a situation that blew away into nothing, and everything worked out for the best. Another spot on card! Then, the next day I drew the Choices card again. And again, I had a decision to make that I was going back and forth on. I was trying to be lenient and kind, resulting in letting someone treat me like a doormat. So when this card appeared, I remembered to make a decision that was right for me, so I did. And less than two weeks later, the situation ended up turning out in my favor as a result of standing up for myself. The day after that, I was still fretting about my decision. I was still worked up about it, worrying whether my action would result in justice. I drew the card Letting Go. I had to laugh at this point at how accurate this deck was for my life. The card told me to let the situation go, and expect the best to happen. So I did. And it did. I had Archangel Raphael come up one day to encourage me to heal my negative thoughts, something I can always, always use a reminder of. The Gratitude card showed up the next day, which I felt went hand in hand with Raphael's message the day before. So as you can see, the card pulls I did with this deck were eerily on point. They were super helpful and a true blessing for me that week. I made actual choices based on the guidance from the cards and I was rewarded with positive outcomes in every instance. The 64 page booklet is a stapled book (no binding) with a thick, glossy cardstock cover. There is a Table of Contents listing the cards in alphabetical order. There is a two-page section on how to use the deck. Then it jumps right into the card meanings. I love when booklets don't beat around the bush, and get straight to the meanings. Every card has its own page. At the top of the page is a small, cropped section of the card image, in black and white. The full card is not shown. Beneath this is the card title and key phrase (also listed on the card itself). Next is a paragraph on the card's meaning. The meanings are very uplifting, inspiring, motivating, and empowering. At the bottom of the page is a mantra specific to each card. For example, the mantra for the Good Fortune card is "I trust in the magic of life to fulfill my desires.". The booklet ends with a page each dedicated to the author and illustrator, and two blank pages for notes. I personally will continue to use this deck for single card draws myself. There is enough to go with in a single card that I feel pulling more might make my readings feel rushed, murky and less complete. Using this deck, I prefer to engage fully with one card at a time, unless another question spawns from that reading. I thought this deck might be just a bunch of pretty pictures with no substance. I couldn't have been more mistaken. I was shocked to find how amazingly the deck read for me, how it addressed my specific situations with incredible precision and true wisdom. I am so grateful for the paths it led me on during the time I worked with it exclusively, and that I was wise enough to trust its guidance. Deck: Mystical Wisdom Card Deck, by Gaye Guthrie, illustrated by Josephine Wall, published by US Games Systems, Inc.